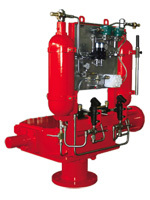 Rotork Fluid Systems manufactures a comprehensive range of valve actuators, controls and associated equipment, serving the oil and gas exploration and transportation, water and waste treatment, power generation, chemical and processing industries. Manufacturing plants in Italy, Germany and the USA are supported by a growing number of Centres of Excellence, strategically located around the world to meet the needs of local markets. Each centre holds stocks, provides application engineering and the packaging of control components as well as the full range of sales, contract, service, installation and commissioning activities. Fluid power actuation specialists at the centres are able to provide solutions to virtually any application requirement. The new facility in Spain joins Centres of Excellence in Australia, Canada, Germany, Italy, the UK, USA (3) and Singapore, which have opened in recent years as Rotork Fluid Systems' international business has experienced unprecedented growth.